Our ‘Look After Your Mate’ campaign aimed to give more students across the UK the knowledge, confidence and skills they need to support their friends at university. Most students talk to their friends when they are having a tough time. Friendship can play a key role in helping someone live with or recover from any difficulties they are facing. But it can be hard to know what to say when a friend is struggling. For a full guide and information on supporting a friend visit our website here. 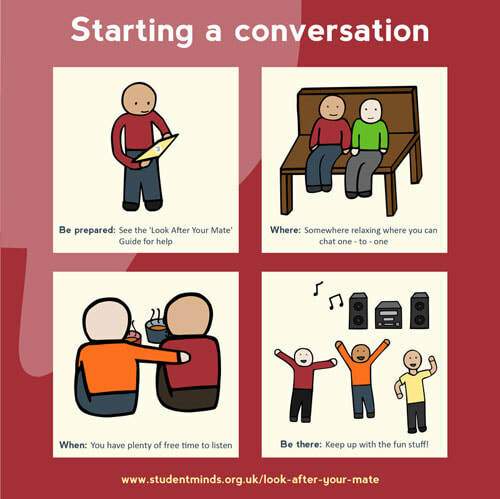 After the success of the campaign, and following further research by the Student Minds team around the importance of looking after friends, we developed our Look After Your Mate workshop and Train the Trainer course. If you want to run this campaign on your campus get in touch for some resources.